Courtesy of Daily Kos, we have this not-very-surprising report that arch-conservative Pat Toomey is thinking of making another run at U.S. 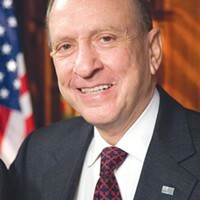 Senator Arlen Specter in 2010. Toomey also said Specter’s age and health will be factors this time around. Two things Toomey might want to consider. First, people can change their registrations back to Republican if they want. Second, half of Pennsylvania's voters -- and two-thirds of its Republicans -- are old and infirm. They can identitify with Specter. I'm hard-pressed to argue against Toomey's point that Pennsylvania's GOP is turning harder to the right. I've argued much the same thing myself. But what's great is that Toomey's argument for why he'll win the primary -- all the liberals and moderates have left the party! -- are exactly the argument for why he'll lose the general election. I mean, does Toomey think that all those liberal and moderate Republicans ... the ones who have banished themselves from the chance to vote in the Republican primary ... are going to line up and vote for a hardline conservative in November?